As part of the series of issuances recently released by the Bureau of Internal Revenue (“BIR”) to implement the provisions of the Tax Reform for Acceleration and Inclusion (“TRAIN”) Act, the BIR has also recently issued Revenue Regulations (“RR”) No. 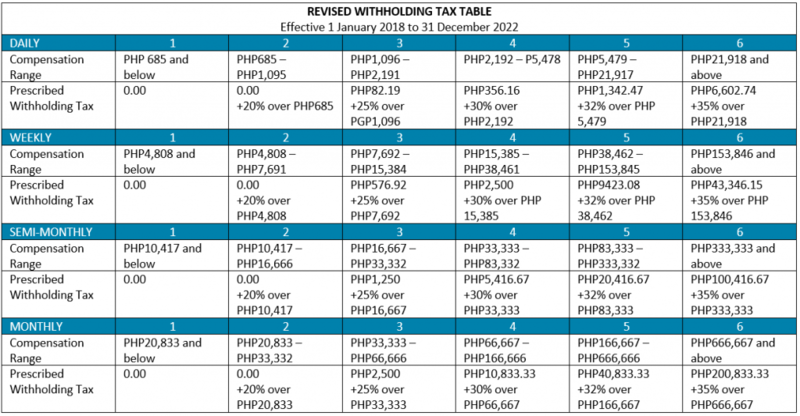 11-2018 (“the issuance”) relative to withholding of income tax. This recent issuance further amends RR No. 02-1998, the pre-TRAIN withholding tax regulations. The final withholding tax on interest income under the expanded foreign currency deposit system (EFCDS) as well as the capital gains tax for sale of shares of stock not traded in the stock exchange was increased to a flat rate of 15%. Due to the increased income tax rates for individuals, the fringe benefits tax was likewise increased to 35% (previously 32%), except for non-resident aliens not engaged in trade or business in the Philippines (“NRA-NETB”) who are taxed at 25%. The CWT rate for professional fees was reduced for individual payees, but was retained for non-individual payees. Moreover, RR No. 11-18 sets out certain formal requirements. Individual payees whose gross receipts/sales in a taxable year shall not exceed PHP 3 million, are required to submit a sworn declaration of his/her gross receipts/sales, together with a copy of Certificate of Registration (COR), to all the income payor/withholding agents not later than 15 January of each year or at least prior to the initial payment of the professional fees/commissions/talent fees, etc. in order for them to be subject to 5% withholding tax rate. b) the income payment exceeds PHP 3 million, despite receiving the sworn declaration from the income payee. 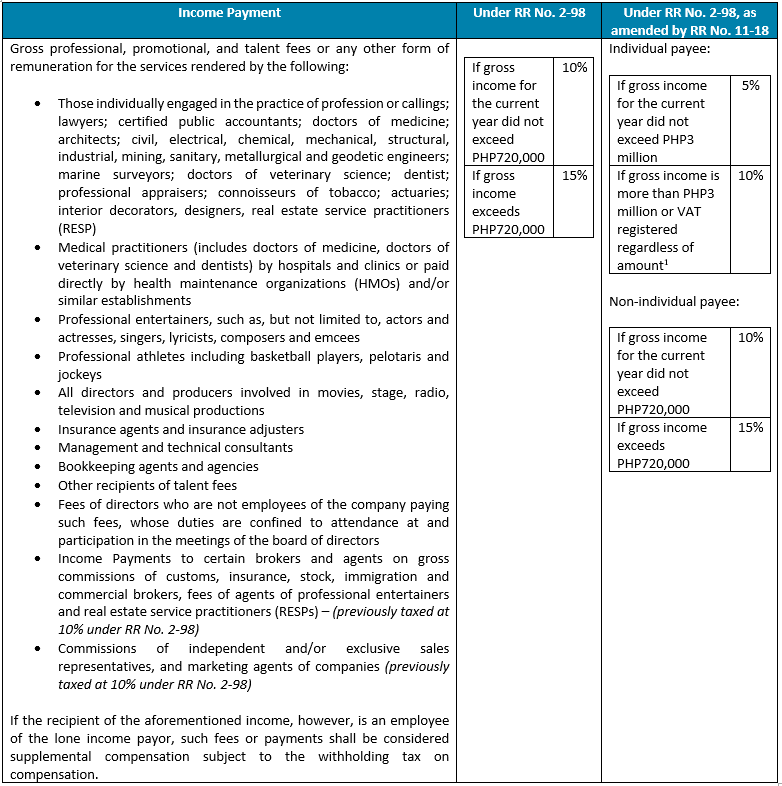 In the case of non-individual payees, if the company or corporation’s gross income is estimated not to exceed PHP720,000 during the taxable year, the authorized officer is required to provide all its income payors/withholding agents with a notarized sworn statement to that, together with a copy of the COR, not later than 15 January of each year or prior to the initial income payment so that the income payor/withholding agent shall only withhold 10%. b) the income payment exceeds PHP720,000, despite receiving the sworn declaration from the income payee. The sworn declaration shall be executed by the president/managing partner of the corporation/company/general professional partnerships. Income payors/withholding agents shall subsequently execute a sworn declaration stating the number of payees who have submitted the income payees’ sworn declarations with the accompanying copies of their COR. Such declaration of the income payors/withholding agents shall be submitted, together with the list of payees, to the concerned BIR office where registered on or before 31 January of each year or 15 days following the month when a new income recipient has submitted the payee’s sworn declaration. Top withholding agents no longer pertain to private corporations alone; individuals may now be considered as top withholding agents and thus liable to the 1% CWT (for goods) or 2% CWT (for services). b) taxpayers identified and included as Medium Taxpayers, and those under the Taxpayer Account Management Program (TAMP). The obligation to withhold shall commence on the first day of the month following the month of publication of the list of the top withholding agents. It may also be posted in the BIR website. The issuance also clarified that the term “goods” does not include agricultural products. As to the obligation of the government to withhold on the payments for its purchases, the issuance clarified that the provision covers a government office, national or local, including barangays, or their attached agencies or bodies, and government-owned or controlled corporations. Any income subject to income tax may be subject to withholding tax; however, income exempt from income tax is consequently exempt from withholding tax. Further, income not subject to withholding tax does not necessarily mean that it is not subject to income tax. The issuance also added that the unjustifiable refusal of the seller-income earner to be subjected to withholding tax shall be a ground for the mandatory audit of all the internal revenue tax liabilities of the seller-income earner and not only the income tax liabilities, in addition to the imposition of penalties. An individual seller-income earner/payee may not be subjected to withholding tax if the source of income comes from a lone income payor and the total income payment is less than PHP250,000 in a taxable year. In this case, the concerned individual shall execute an Income Payee’s Sworn Declaration of gross receipts/sales that shall be submitted to the lone payor. The income payor/withholding agent shall in turn execute its own Income Payor/Withholding Agent’s Sworn Declaration, which will be submitted to the BIR. The duly received income payor/withholding agent’s sworn declaration including the required list shall serve as proof that the income payments made are not subject to withholding tax. In the event that the individual payee’s cumulative gross receipts in a year exceed PHP250,000, the income payor/withholding agent shall withhold the prescribed withholding tax based on the amount in excess of PHP250,000, despite the prior submission of the individual income payee’s sworn declaration. On the other hand, if the individual income payee failed to submit an income payee’s sworn declaration to the lone income payor/withholding agent, the income payment shall be subject to the applicable withholding tax even though in a taxable year the income payment is PHP250,000 and below. b) the income payment exceeds PHP3 million (PHP720,000 for non-individual payees), despite receiving the sworn declaration from the income payee. Local Water Districts (LWDs) are added to the list of exempt entities. the sworn declaration has been submitted to the lone income payor/withholding agent on or before 15 January of each year or before the initial income payment, whichever is applicable. Sales of real property by a corporation which is registered with and certified by the Housing and Urban Development Coordinating Council (HUDCC) as engaged in socialized housing project is exempt provided that the selling price of the house and lot or only lot does not exceed the socialized housing price applicable to the area as prescribed and certified by the said board/council as provided under Republic Act No. 7279 and its implementing regulations. Prior to this, the threshold under RR No. 2-98 is PHP180,000 in Metro Manila and other highly urbanized areas and PHP150,000 in other areas or such adjusted amount of selling price. the Joint Venture itself must likewise be duly licensed as such by the PCAB of the DTI. Joint ventures involving foreign contractors may also be treated as a non-taxable corporation only if the member foreign contractor is covered by a special license as contractor by the PCAB of the DTI. The construction project may also be treated as non-taxable if the project is certified by the appropriate Tendering Agency (government office) that the project is a foreign financed/internationally-funded project and that international bidding is allowed under the Bilateral Agreement entered into by and between the Philippine Government and the foreign/international financing institution pursuant to the implementing rules and regulations of Republic Act No. 4566 otherwise known as Contractor’s License Law. The issuance also clarified that while certain income payments are exempted from withholding tax (e.g., retirement benefits, social security benefits, separation pay, etc. ), they may still be subject to income tax depending on the nature/sources of the income. 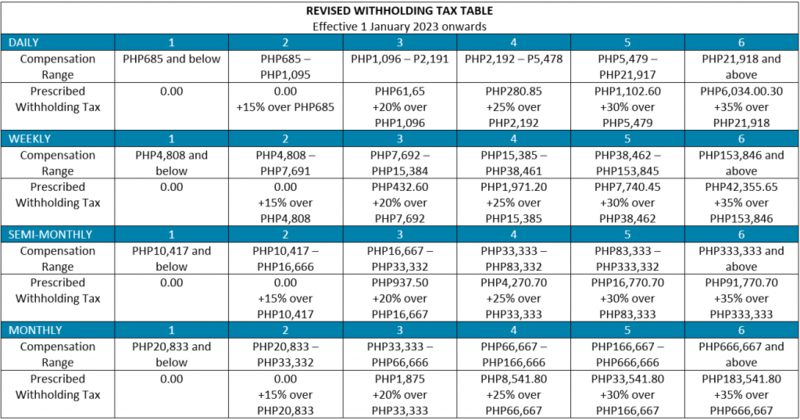 The ceiling amount for thirteenth month pay and other benefits which are exempt from withholding was increased from PHP82,000 to PHP90,000. The compensation of employees in the public sector who are paid not more than the statutory minimum wage applicable to non-agricultural sector is likewise exempted from withholding tax. In case of hazardous employment, the employer shall indicate in the Alphabetical List of Employees, the minimum wage earners who received the hazard pay, the period of employment, the amount of hazard pay, and the justification for such payment as certified by the concerned DOLE/allied agency, which certification is part of the attachment in the filing of the Annual Information Return (BIR Form 1604-C). In the case of employees under the public sector, the document to be attached is the Department of Budget Management (DBM) Circular related to such payment of hazard pay. If the net taxable compensation income earned during the year does not exceed PHP250,000, it will be exempt from withholding tax. The withholding tax on compensation of employees of Area or Regional Headquarters of multinational corporations, regional operating headquarters, offshore banking units, and petroleum service contractors and sub-contractors shall be computed using the regular rates and in the same manner with the computation of the withholding tax on compensation of citizens and resident individuals. Previously, under RR No. 2-98, the compensation income earned by the alien employees and other qualified Filipino employees of the entities are taxed at 15%. The PHP50,000 personal exemption and PHP25,000 additional exemption for each dependent child were likewise deleted from the list of items exempt from withholding tax in accordance with the repeal of the provision granting said exemptions under the TRAIN. The income taxes on the compensation income of the husband and the wife shall be withheld separately. 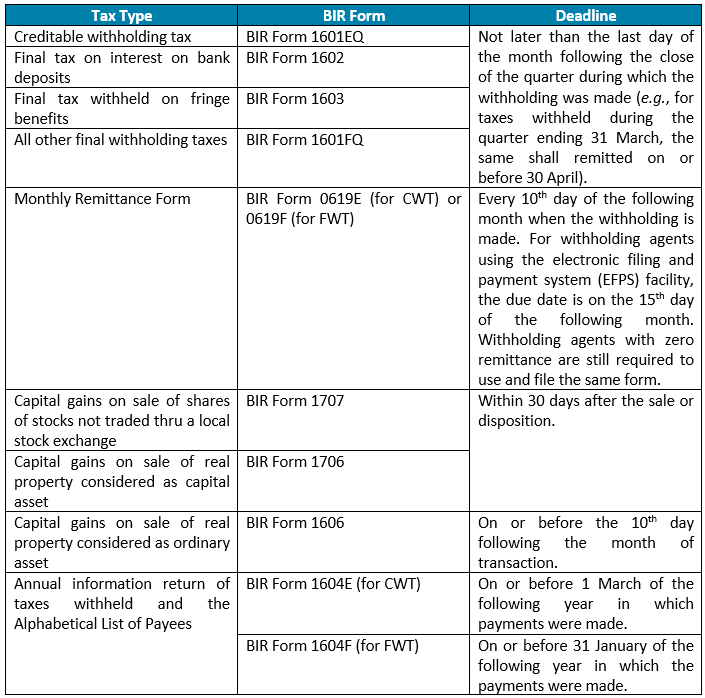 The issuance also laid down in detail the formal requirements for BIR Form 2316 (annual withholding statement to be furnished by the employer to the employee). Please note that that while RR No. 11-18 was dated 31 January 2018, Section 16 of the same states that the regulations are effective beginning 1 January 2018. However, as clarified by BIR Deputy Commissioner – Operations Group, Atty. Arnel SD. Guballa, the regulations should be applied prospectively, and hence deemed to be effective only from the date of its publication.